As an immigrant seeking a place to belong, I couldn’t have felt more out-of-place than when I moved to America shortly before the 2016 presidential election. And as the vitriol escalated, I never expected to find solace on two wheels. Here’s how it happened: Nearing 30, I found myself yearning for a previous life. As an international economist, I lived and worked in Africa for most of my 20s. But after a while, I longed for familiarity, to not be instantly labeled and treated as an outsider because of how I looked and spoke: a South Asian woman with a North American accent. I missed, too, my home in Canada. Jobs in international economics are rare in North America, so I was delighted when I found one in Denver in September of 2016. Colorado seemed to offer everything I wanted: a short flight to my mom in Calgary, the mountains, and a climate that made it easy to be outside year-round. Only after I arrived, in a daze of reverse culture shock, did I look up the statistics: 80 percent of Denver’s population was white. I was nearly as much an outsider here as I’d been in Africa. 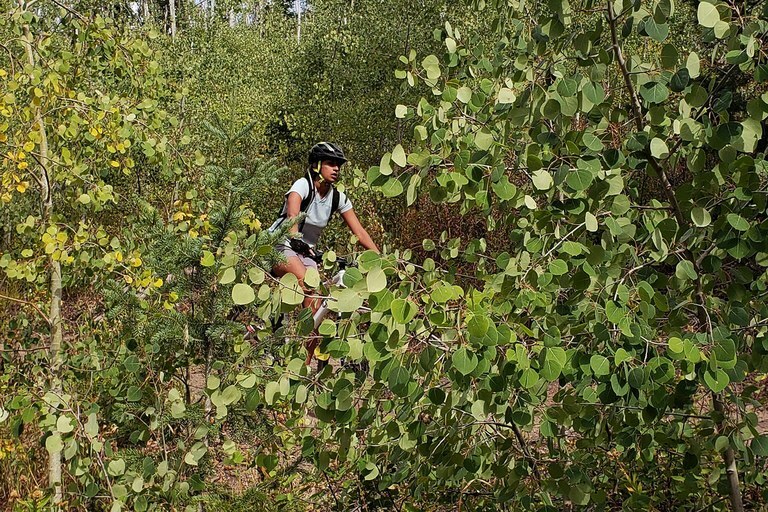 Though confident while out riding on trails, Raksha Vasudevan constantly pushes up against a culture of mountain biking that is predominantly white and higher income. That sense of alienation only mounted after Donald Trump’s unexpected victory. The day after the election, I wanted desperately to go to the mountains, far away from people who had chosen a leader who seemed to hate people like me — people of color, immigrants, women. But, like most women of color in Colorado, I’d realized after I got here that I earned a disproportionately low salary. Given Denver’s growing cost of living, I could only visit the mountains when my few car-owning friends did — and none of them wanted to leave their homes that day. In the following weeks and months, as rhetoric and violence against people of color escalated, I hesitated to go beyond the city, into rural areas, where diversity was likely to be even lower, making me all the more visible. The lack of crowds — something I used to love about wide open spaces — now scared me, my sense of adventure troubled by visions of being attacked and left in the forest. In Fremont, California, a South Asian woman who went hiking just a few weeks after the election returned to find her car window shattered and a note calling her a “Hijab wearing b—--” who should “get the f--- out.” I debated leaving, perhaps returning to Canada. But that seemed like a defeat, a confirmation that people like me didn’t belong in the outdoors — or anywhere in America. Things began to change in the spring, when a mountain-biking friend convinced me to try it. “There’s nothing that makes you feel more alive,” he said. That’s what the outdoors had always done for me — before it started to appear both inaccessible and hostile, reserved for people with specific levels of material wealth and melanin. Partly to challenge my own perceptions, I rented a bike and started riding with him. Immediately, I was hooked: the searing uphill climbs, the adrenaline of hurtling downhill. There was no time for self-consciousness, no opportunity for other trail-users to ask, “Where are you from?” I started saving to buy a used mountain bike. But once again, in outdoor gear shops and biking groups, surrounded by pale-skinned people with visibly larger budgets, I felt not only poor but out of my depth. Despite the challenges, I kept biking precisely because I didn’t fit in on the trails, the sports shops or groups. Yet I craved a future where I did. After all, people of color and immigrants also pay taxes that fund state and national parks. We, too, deserve the sight of forest green and sky interrupted only by mountain peaks — and to have a choice in how we experience the landscape, whether by foot, bike, horseback, kayak or some other way. But I wasn’t willing to wait for everything to become easily accessible for people like me — I had to start now. And perhaps by doing so, I’d help to create that future. Still, that dream is continually threatened. Recently, a friend and I traveled to western Colorado to bike, Mesa County’s trails being among the best in the country. On the drive to the trailhead, we passed at least three trucks with MAGA stickers. I knew Mesa County had voted 64 percent Republican in the 2016 election. At the trailhead, I sat in the car for a long time before setting off, filled with trepidation. On the trail, I stopped to take a picture of yucca clinging improbably to slanting canyon walls. A man in a camouflage shirt walked towards me. As he got closer, he blinked noticeably, as if surprised to see someone like me there. But he nodded as he passed by, and I released the breath I hadn’t known I’d been holding. All my worries — money, my U.S. visa, the perceptions and reactions of others — were still with me on the trail, sometimes bubbling up, but gradually dissolving the longer I biked. The trail demanded my attention urgently — jagged switchbacks, tree roots swelling up suddenly from the soil—and at other times, gently. The wind brushed my scalp through my helmet vents. A jaybird call broke the slog of pedaling uphill. A flash of red appeared as my front tire passed blooms of Indian paintbrush. I couldn’t have anticipated any of it, yet it was exactly what I needed.